People drink the dandelion root tea for weight loss, as a diuretic, and to treat digestion problems. Dandelion root benefits are plenty: It offers a multitude of health perks such as zinc, potassium, Vitamins A, C, D, and B. The root will treat an upset stomach or digestion problems. Dandelion root tea also is an alkalizing substance, a laxative, diuretic, and venotonic. 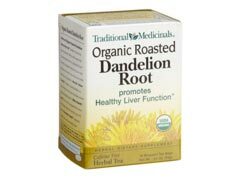 Dandelion root tea benefits are noted when studies have shown dandelion to normalize and control blood sugar levels. The test was done on diabetic mice, at the University of Maryland Medical center. Some not very pleasant side effects can be that it irritates the stomach. Some people also feel burning into the center of the chest, thus reminiscent of heartburn. Some react with skin rashes, especially of the tea contacts skin around the mouth. These effects usually pass in mere hours, sometimes days. If there are more rashes, the individual is probably allergic to dandelion root tea. To check for related allergy triggers, if you have issues with marigolds, daisies, or chrysanthemums, you may also be allergic to dandelion. Drinking the dandelion root tea will only serve you mouth sores, breathing difficulty, and wheezing. Not pleasant. There is also a dandelion root tea side effect related to combination with certain medications and pills. There are chemicals named coumarins, which increase risk of bleeding when combined with counter drugs. These are aspirin, anti – platelet drugs, and warfarin, hepalin, and naproxen. Some people resort to taking laxatives to lose weight, but it is simply not the best of ideas. Laxatives will only cause bad side effects, such as stomach aches, and more serious health problems. Laxatives can deplete the body of all nutrients, because they are not being properly absorbed. And the body has lack of vitamins, and calcium. Other side effects could be nausea, vomiting (the medication in laxatives upsets the stomach lining), diarrhea and dehydration, rectal bleeding, and fainting (from dehydration and diarrhea). A much better, more natural resolution for improving bowel movement and digestion is Psyllium Husk , or psyllium husk powder. Psyllium husk benefits are varied. This powder is ground from psyllium seeds, and it is much safer than laxatives. It can be used daily, and should be taken without any other medications. What it gives, is fiber, which helps carry metabolic wastes. The fiber will reduce high cholesterol and will treat both diarrhea and constipation. This type of fiber also helps wonderfully with irritable bowel syndrome and hemorrhoids. Of course, most fiber must come from the cereal and fruit that you consume, however- psyllium is another great addition.